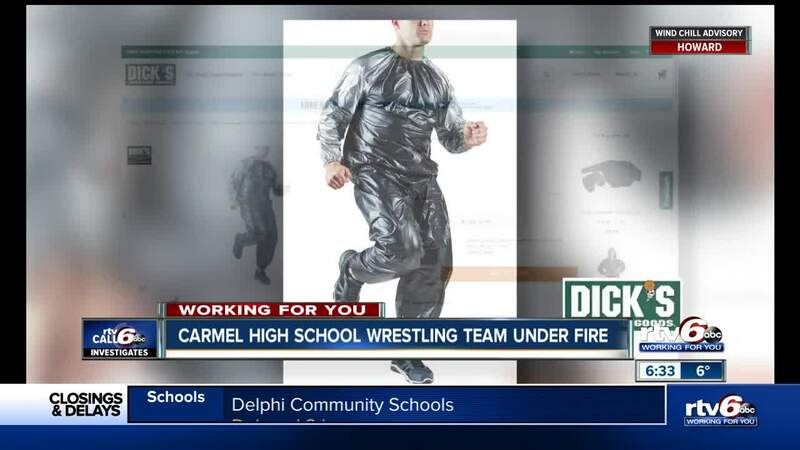 The eight athletes and coaching staff at Carmel High School came under fire for breaking state and national High School Athletic Association rules by using weight loss suits to quickly shed weight, according to documents obtained by Call 6 Investigates. 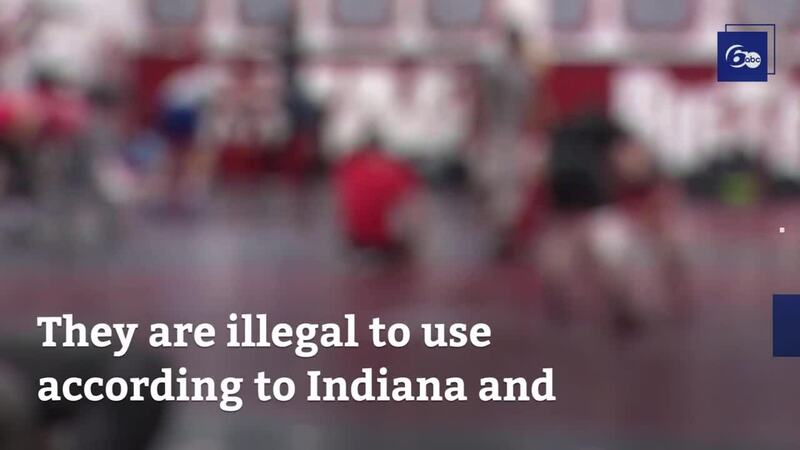 CARMEL — Multiple wrestlers at one of the top high school athletic programs in the state have had to forfeit their scores this season after they were caught using illegal and dangerous ways to lose weight during the season, just days before sectionals get underway around the state. Those suits, commonly called sauna suits, are made of rubber, vinyl or another non-breathable material that causes the the body's internal temperature to increase and causes profuse sweating in an effort to cause rapid loss of body weight by loss of water. The suits are considered dangerous because of the dehydrating effect they cause and were responsible for multiple deaths to high school and college wrestlers in the late 1990's. The use of the suits is illegal for high school athletes according to the National Federation of High Schools and the Indiana High School Athletic Association. According to the documents obtained by Call 6, the Carmel High School's athletic department was made aware of the suits being used and the athletic department acted quickly and self-reported it to the IHSAA, which is required, according to IHSAA officials. The eight Carmel High School wrestlers were forced to forfeit their matches throughout the course of 19 different competitions during the season, but will be allowed to wrestle in sectionals this weekend, according to ISHAA. Carmel High School's Athletic Director also sent a letter to schools in their conference apologizing, detailing the violation and the school's actions. You can read the full letter below. The purpose of this correspondence is to provide you with information regarding rules violations committed by the coaching staff. In the last several days, it has been determined a number of our student-athletes have worn weight loss suits during practices this season under the supervision of our coaching staff. The use of weight loss suits is prohibited by the National Federation of High Schools (NFHS) Rules Book. Rule 4-4 ART 3…. At any time, the use of sweat boxes; hot showers; whirlpools; rubber, vinyl, and plastic-type suites; or similar artificial heating devices; diuretics; or other methods for quick weight reduction purposes is prohibited and shall disqualify an individual from competition. The violation of this rule has been self-reported to the Indiana High School Athletic Association (IHSAA). As a result, eight student-athletes have forfeited matches throughout the course of 19 different competitions during the season. We have started the process of working with our staff to insure future violations do not occur within the program. I apologize you have to receive this communication as we always strive to be leaders in our state in all areas of our athletic programs. The violated rule will be corrected moving forward as well as other measures to insure the health and safety of our student-athletes. Thank you for your continued support of our wrestling program."